Is there a plumber in the house??? 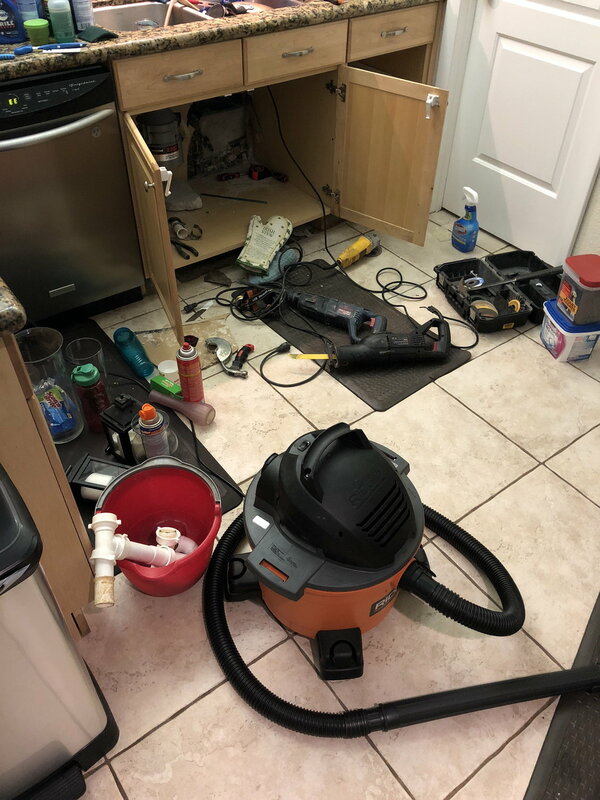 I’ve got a drain pipe leaking in my kitchen. I’ve got the wall open and I can see where the pipe is leaking but I can’t figure out how to cut loose. 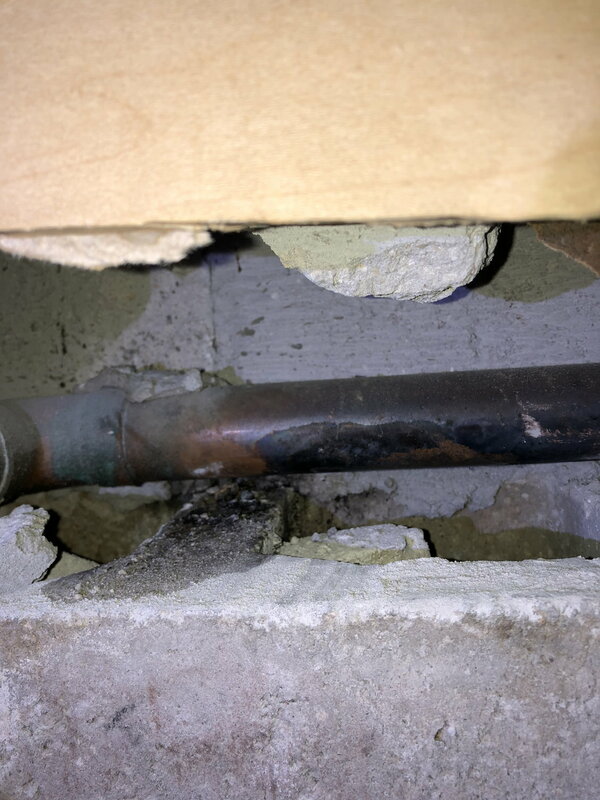 It’s about an inch and a quarter copper pipe and it’s almost touching the block wall in the back, definitely too close to get a pipe cutter around. What are my options? Cut a fernco or no-hub connector and wrap around it? Cut off wheel on a grinder. 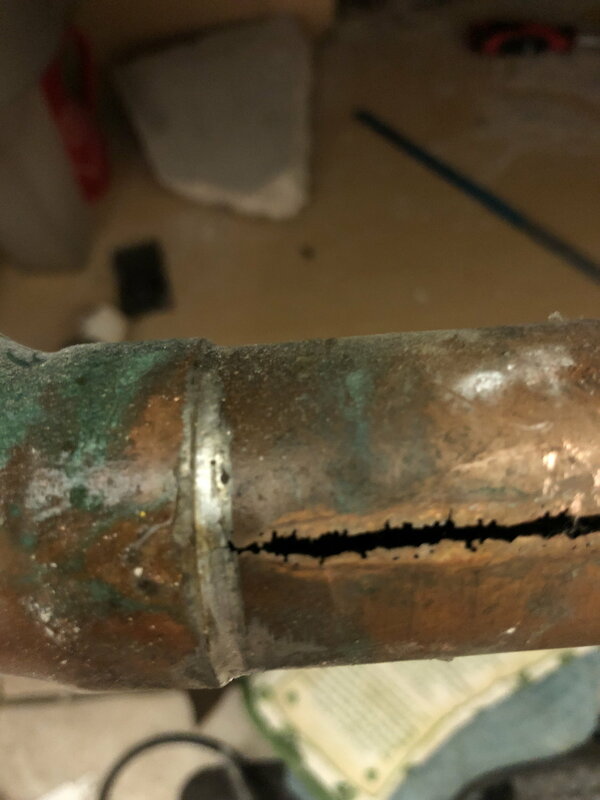 Who uses copper for drain pipes? This is the easiest way, older houses used copper for drains. I would cut out as much as you can in both direction and fernco in pvc as stated before. You can can see where is is deteriorating on the seam where the copper tubing is made. Rest of the pipe is going to look the same if not now the eventually down the road. I speak from experience. I assume it’s a kitchen drain? good old draino been working on it? they have those saws now a days that have blades the spin in oposit directions and supposadly will cut anything. OH BTW KILL THOSE SPORES !!! Before they dry and float all through your house !!! WHEW!!! I got it. Hacksaw blade did the trick. I removed as much as I could reach, I guess I’ll fernco it over to pvc now. Why not do it right abd re solder on a new piece of copper? Is it copper or brass? The diameter of the copper is to small for standard fernco and don't tighten well. But they will fit good over a fitting if you can get to one down the line . Did Tommy recommend a radiator hose?? The work glove is awesome, makes me hungry. Is copper too soft to tighten clamps on without crushing the pipe?